Affiliations | Urban Herriges & Sons, Inc.
(National Association of the Remodeling Industry) NARI’s certification program recognizes the skills and achievements of five distinct groups of remodeling professionals of particular interest to homeowners: Certified Remodeler (CR), Certified Remodeler Specialist (CRS), Certified Kitchen & Bath Remodeler (CKBR), Certified Remodeler Associate (CRA) and Certified Lead Carpenter (CLC).What does NARI Certification mean to you? | Who are NARI Certified professionals? | How does a Remodeler become certified? 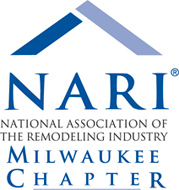 (Our Local NARI Chapter) We have been an active member of NARI in Milwaukee since 1986. NKBA (National Kitchen & Bath Association)The National Kitchen and Bath Association is a growing non-profit trade association with over 25,000 members. The NKBA has led the kitchen and bath industry for over forty years by providing resources for consumers and industry professionals. Not only does NKBA host the world’s largest trade show and offer educational programs, but they also enhance the success of their members by promoting professionalism and ethical business practices. In order to benefit consumers, the association monitors national and state legislation to protect the industry, their members, and you, the consumer.